Sprained your Ankle? The latest and greatest advice to get you going again. Ankle sprains are one of the most common injuries we treat in the clinic- especially during winter with lots of team sports involving change of direction at speed. They hurt, they limit your everyday function as well as your ability to take part in sport, and they often re-occur. 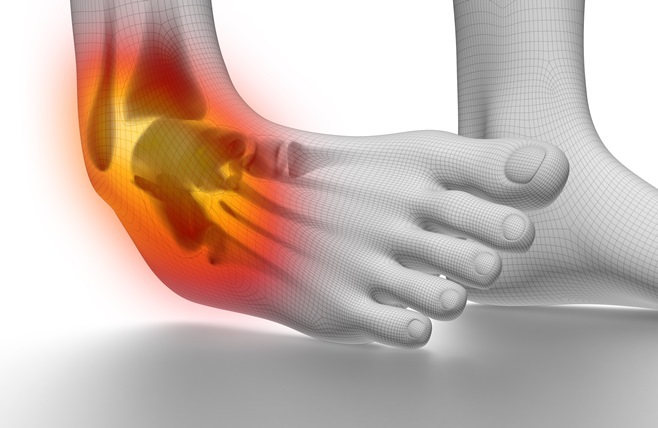 So what are the latest guidelines that have been released to assist with optimal management following an ankle sprain? There is not a huge amount of evidence behind this in the long-term however it is more effective at decreasing swelling in the short term RICE does not improve ankle range of movement. If you are going to do this, a combination of ice, elevation and compression tends to work best so put the tubigrip on, strap the ice on and get that ankle above hip height. Physiotherapists cannot prescribe medication and we always suggest talking to your GP or pharmacists before taking medication. The role of anti-inflammatories is questioned following an ankle sprain as they may slow down the initial healing process (The bleeding that occurs following a sprain is bringing the products needed to help repair the structures). They do however decrease pain in the initial stages so if pain is a major factor then they may be useful. Use of a functional support and exercise therapy generally provides better outcomes than if you are immobilised in a boot or cast. If you are immobilised (for a ligament sprain) it should be for a maximum of 10 days. The best outcomes happen when exercise therapy starts early (so do not wait for weeks until coming in for a visit after spraining your ankle. A structured exercise program decreases the risk of recurrent sprains, decreases the risk of ongoing ankle instability, shortens recovery times and improves long term outcomes. In the case of recurrent ankle sprains, exercises should be included into the regular training program. Conservative (Physiotherapy) treatment is still preferred over surgery for all patients due to being less invasive and with the risks associated with surgery. In professional athletes, surgical treatment may be preferred due to quicker return to play time and surgery may also be appropriate if complaints are not resolved by conservative physio. Get in early to see your physiotherapist for an exercise program and a strapping/ a brace if needed for support. Use RICE and anti-inflammatories if you need to settle down pain. And for the majority of people doing physiotherapy instead of going down the surgical line is appropriate.